Tomb and Mortuary Chapel of the Theban Official Sen-Nezem. Der el Medineh - Sen-Nezem and his wife Ai-nafert appear here adoring two rows of Gods, who are seated within a pavilion with a cobra-frieze. Above, are the jackal guardians of the tomb, with a small lotus-crowned jar between; while over all is the ring of infinity, the sign for water, and a red vase with a sacred eye on either side. The Deities, who are all seated on Maat, Goddess of Truth, are not named individually. Horus or Ra, the head of the lower row, is followed by three pairs of male and female deities alternately. Osiris leads the upper row and behind him are three red-faced Gods with two green-faced Goddesses between. 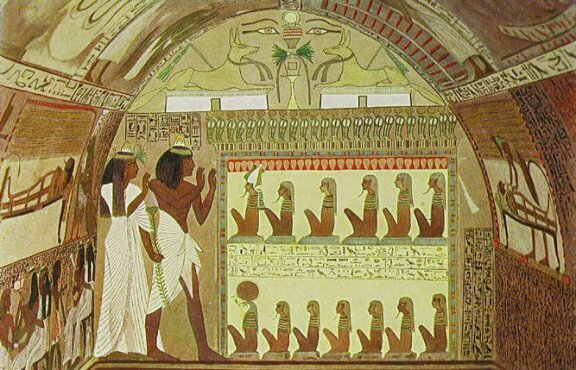 The three horizontal lines of inscription seen between the two rows of the deities is a part of a hymn to the Setting Sun included in chapter 15., B.3, of the Book of the Dead.